Aransas named a stand-out refuge! National Geographic has chosen Aransas as one of 6 stand-out National Wildlife Refuges! Read about it here! Even though the weather was cold, the Rockport Whooping Crane Strut was lots of fun. The refuge mascot was there, along with her handler, Visitor Services Manager Laura Bonneau. Our favorite big bird started the race, greeted runners & walkers at the finish line, and helped hand out prizes. Friends of Aransas representatives were there to talk with people about Friends and the refuge. A portion of the registration fees will be donated to our Water for Wildlife Fund. We appreciate everyone that participated, and especially the Rockport Parks Department for letting us partner with them in this fun event. To see more photos visit our Facebook Page. You don't have to register for Facebook to see our page. 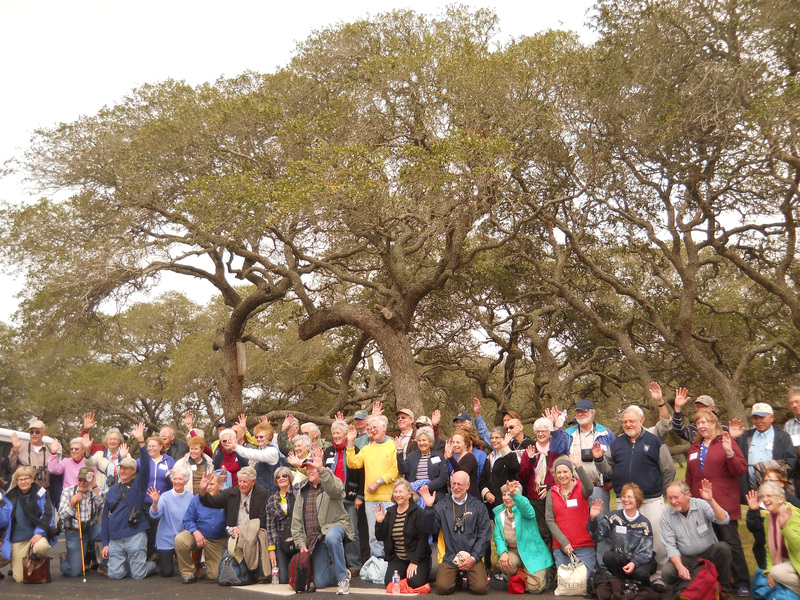 US Fish & Wildlife Service Retirees held their 2015 reunion in Corpus Christi, and visited the refuge March 3rd. For many, it was their first visit here. Even though retired, they are still committed to supporting National Wildlife Refuges and their Friends organizations. Aransas NWR nominated for Best Refuge! USA Today 10Best has announced the nominees for Best National Wildlife Refuge, and Aransas is on it. There are some great refuges on the list, but we all know how special Aransas is. The contest runs through March 30th, at 11:59 a.m. You can vote every day until then. You can vote here. 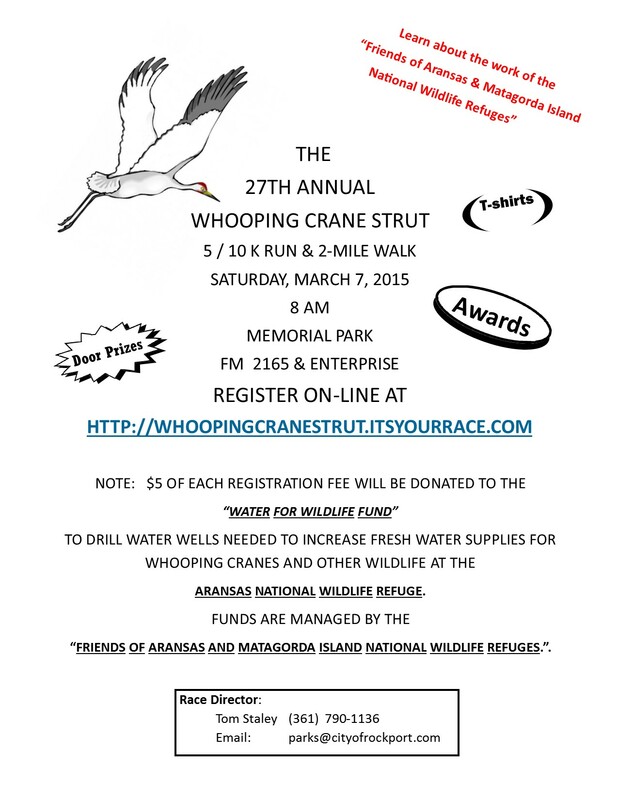 27th Whooping Crane Strut to benefit Friends of Aransas! 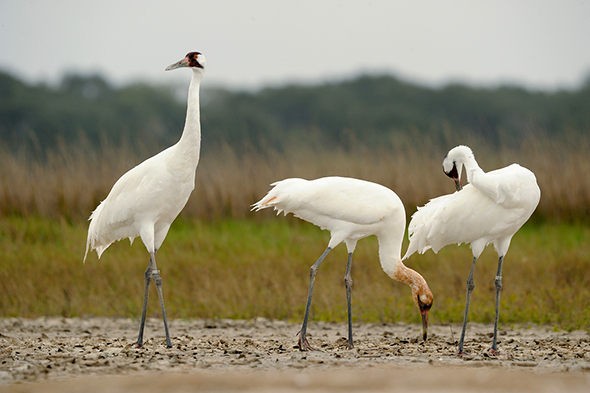 about the importance of reliable fresh water sources for Whooping Cranes and other wildlife, answer questions about the cranes, and give out information about Aransas National Wildlife Refuge. The refuge whooping crane mascot will also make an appearance. If you'd like to volunteer to help for a couple of hours during the race by staffing a drink station or pointing runners in the correct direction, email us your contact information. Volunteers will receive a race T-shirt. To learn more about the event, or to register, visit the race website. Whooping Crane Festival this weekend! 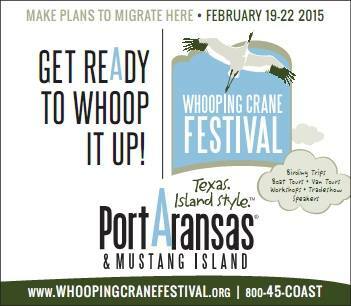 If you're in the Texas Coastal Bend area, be sure to come to Port Aransas & check out the Whooping Crane Festival. We will be in the Bird Nest Trade Show 9:00 a.m. - 6:00 p.m. Friday 2/20 & Saturday 2/21, and 10:00 a.m. - 3:00 p.m. Sunday 2/22. We'll have a great selection of books for all ages, including a brand new book, Birdology: 30 Activities and Observations for Exploring the World of Birds. Written for budding naturalists, it's full of fun ways to learn about birds. For adults, we have Pete Dunn's The Art of Bird Identification. Not a field guide, it gives tips on how to observe key factors in identifying birds. We also have new t-shirt designs, including 2 featuring drawings by David Allen Sibley. There are new canvas totes, educational games, and much more. As always, we'll have free information and people to answer your questions about Aransas NWR. There's lots going on there, with shuttle bus tours, new boardwalks, etc. Come by to shop, or just to say hello. Hope to see there. Look what's new at Aransas NWR! 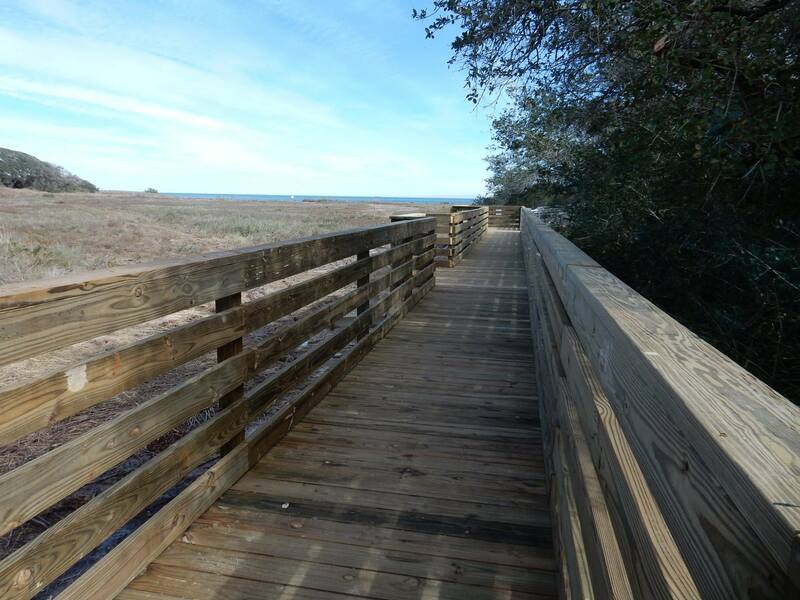 There's a beautiful new boardwalk at the refuge towers, and now a new boardwalk & viewing platform at the end of Big Tree Trail. The workers, staff & volunteers, did an excellent job & they should last for many years. For more photos, click here for our Facebook Page. You do not have to register for Facebook to look at our page. If you are registered, though, please "like" our page. Reward offered in whooping crane death! Friends of Aransas has pledged $5000 to a reward fund for information in the death of a whooping crane found dead January 4th in Aransas Bay. Through pledges, Friends of Aransas, International Crane Foundation, San Antonio Bay Foundation, Aransas Bird and Nature Club, Audubon Texas, & Whooping Crane Conservation Association will offer a combined amount of $14,000. Added to the $2500 offered by the U. S. Fish & Wildlife Service, and $1000 by Texas Parks & Wildlife Department, the total reward will be $17,500. The reward will be issued if the death of the whooping crane is determined to be a criminal act and the information provided leads to the criminal conviction of the person(s) responsible. Anyone with information about the whooping crane’s death is urged to come forward. Information can be provided to the Fish and Wildlife Service’s Houston Office of Law Enforcement at (281) 876-1520, or Operation Game Thief at 1-800-792-GAME (4263). Callers may remain anonymous. Free Tours at Aransas National Wildlife Refuge! Aransas National Wildlife Refuge will be offering free tours of the refuge this winter. The tours will be led by refuge staff & trained volunteers, and are sponsored by Friends of Aransas. They are scheduled to begin February 5 and run Thursdays-Sundays. The tours last about 2 hours, and no reservations are needed. This winter, the refuge has the use of a handicapped accessible shuttle bus for the tours. For more information on the tours, phone or email Aransas National Wildlife Refuge. The San Antonio Bay Foundation will be conducting an organized crab trap removal effort in San Antonio Bay 2/20 - 3/1/2015. They can still use a few volunteers with boats to help. During the last two annual crab trap closures, they collected 264 traps. Abandoned, or "ghost" traps, are hazardous to a variety of wildlife. If you can help, or want more information, contact Dan Alonso at (830) 660-4429.